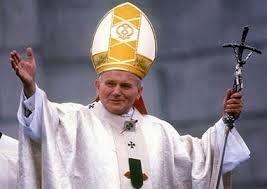 POLITICAL TIDBITS: In this Easter Season of Grace and on eve of historic canonization of two Popes of 20th century, let's recall the Great Jubilee Year 2000 launched by John Paul II and his opening of holy doors of four patriarchal basilicas in Rome---in a Faith steeped in rich ancient tradition. Easter Vigil part of that great Church tradition. Costa Rica Ambassador to Holy See, in his book launched in Manila recently, testifies on miraculous healing of his seriously ill infant son and wife, through intercession of Padre Pio. In this Easter Season of Grace and on eve of historic canonization of two Popes of 20th century, let's recall the Great Jubilee Year 2000 launched by John Paul II and his opening of holy doors of four patriarchal basilicas in Rome---in a Faith steeped in rich ancient tradition. Easter Vigil part of that great Church tradition. Costa Rica Ambassador to Holy See, in his book launched in Manila recently, testifies on miraculous healing of his seriously ill infant son and wife, through intercession of Padre Pio. In eager anticipation of the historic canonization of two popes of the 20th century this coming Sunday in Rome, I have been neck-deep into reading on Vatican II, the outstanding achievement of Blessed John XXIII's pontificate, and the biography of Blessed John Paul II, so lovingly written in fantastic fullness by American writer George Weigel, acknowledged one of the world's leading authorities on the Catholic Church. In Volume II of Weigel's magnum opus, "The End and the Beginning," he dwelt in detail about how the Pontiff launched the Great Jubilee Year 2000 that ushered in the Third Millenium. When Karol Cardinal Wojtyla of Krakow was elected Pope on Oct. 16, 1978, then Primate of Poland Stefan Cardinal Wyszynksi told him that the Holy Spirit precisely chose Wojtyla to be God's instrument to lead the Church in the Third Millenium. I presume this assertion from his compatriot and former senior prelate encouraged John Paul II to make Holy Year 2000---the 2000th anniversary of Christ's incarnation--- especially meaningful and historic. The Church is an ancient institution steeped in traditions and one of the most revered is the observance of Holy Year every 25 years. A bronze door at the extreme right of St. Peter's is kept closed throughout those 25 years, and only opened during Holy Year in solemn rites awash with indulgences. This practice of observing Holy Year dates from Feb. 22, 1300 during the reign of Pope Boniface VIII, who intended it to be commemorated every 100 years. But its observance became so popular that it was repeated with more frequency---so that now it's observed every 25 years (I was lucky to visit Rome and pass through that door in 1975 and again in 2000. Doubtless I won't be that lucky in 2025, but I already feel more than blessed to be able to mark those two Holy Years). Weigel wrote that the practice of opening Holy Doors at the three other major Roman basilicas (St. John Lateran, St. Mary Major and St. Paul Outside the Walls) was began in 1499-1500, but John Paul II, already more than 21 years in the Papacy and beginning to suffer rather poor health, made sure that his marking the end of the Second Millenium and ushering in the Third Millenium ---the "Great Jubilee year 2000"--- would be a break from tradition. Hence, he opened the traditional Holy Door of St. Peter's during Christmas Eve of 1999, and then also opened the Holy Doors of the other three patriarchal basilicas in Rome within two weeks' time. The transition from the Second to the Third Millenium was so special to JPII that he issued an encyclical just for it: the "Tertio Millennio Adveniente." In that encyclical he wrote, as quoted by Weigel, that "the Holy Door of the Jubilee of the Year 2000 should be symbolically wider than those of previous Jubilees, because humanity, upon reaching this goal, will leave behind not just a century but a millenium." Reading through all these details of the glorious Pontificate of JPII that enabled me to vicariously live through various decades of Church history, thanks to George Weigel, I was inspired to soak in the rituals of Easter. Normally I attend mass only on Easter Sunday proper, but last night, Holy Saturday I decided to attend Easter Vigil at my parish church which began at 9 pm. until nearly midnight. It began with a short procession by the priests, one of whom carried the tall Easter candle, around the church premises where they lighted a small fire in one corner using sticks and dried shrubs. Then the procession entered the darkened church where at some point the faithful was asked to light their candles---just the soft glow of candles. The liturgy for Easter Vigil began with a proclamation recalling the Passover feast and how God freed the people of Israel from their slavery and led them dry-shod through the sea---"This is the night when the pillar of fire destroyed the darkness of sin..." Then came seven readings from the Old Testament (Genesis, Exodus, Exequiel, etc., beginning with the near oblation by Abraham of his only son Isaac, when God stopped him, happy in the thought that the patriarch was willing to please Him by sacrificing his son, and two readings from the New Testament. Then came the "Gloria" which is very dramatic: the tall Paschal Candle lit as the faithful's light is extinguished, and ringing of Church bells as the purple Lenten drapery is pulled down from the altar statues. This is followed by the renewal of baptismal promises by the faithful and the liturgy for Easter, with the gospel reading recounting the encounter with the Risen Christ by the holy women. It's a ritual ancient and yet so contemporary: "Christ yesterday and today, the beginning and the end, Alpha and Omega, all time belongs to him." Last March 24, Philippine Ambassador to the Vatican and the Sovereign Order of Malta Mercedes Tuazon sponsored the launch of a book titled "A Spiritual Son is Born, Our story with Padre Pio of Pietrelcina," written by her Vatican colleague, Ambassador Fernando F. Sanchez Campos of Costa Rica, about the miraculous cure of the latter's infant son Fernando Felipe and his wife Milagro---through the intercession of St. Padre Pio. Sanchez Campos journeyed to Manila for the Wack Wack Golf and Country Club launch, and its success was doubtless due to the popularity of the well-loved Saint from Pietrelcina, renowned for his powerful intercessions, the drawing power of guest of honor Cardinal Tagle, the gracious diplomat-author and the vast social circle of Mercy Tuason. In this season of grace and faith in the Risen Christ, I'm happy to present the edited synopsis to this book, billed as a "hymn of faith" and available at popular bookstores. "What does a man do when, at thirty-three years of age he's faced with the following: his firstborn, just hours after being born, is diagnosed with an atrial flutter (a heart condition where the heart beats at 220-240 a minute instead of the normal 130-140) that not even five electric shock treatments, seven long days in the neonatal intensive care and special medications could normalize the contractions of his heart muscle; his wife who, four days after her Caesarian delivery, began to have renal hemorrhage and respiratory problems, losing 70% of renal function in both kidneys; and he himself, on the verge of crisis in his political career because some people were trying to put an end to it---so much were they opposed to his ideas? "Sunken deep into the abyss, completely broken down, he decides to make the sacrifice of Abraham when the latter immolates his son, Isaac, out of faith and obedience to Yahweh’s seemingly “illogical” command. Sustained only by the power of his faith, he gives everything up to God. "But God comes to his aid. 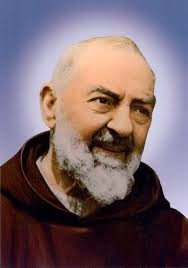 On September 23, 2007 evening, seven days after the birth of his son, through unexplainable circumstances a priest carrying a relic of Padre Pio, enters the neonatal intensive care unit at midnight, to pray to God for cure of little Fernando, through the intercession of the Capuchin saint. The same relic is also brought to the bedside of his wife, Mila. "The next day, to the surprise of the medical staff, the baby’s heartbeat begins to normalize and the mother gets better. A miracle takes place. "In this book Ambassador Sánchez Campos relates the dramatic story of the miraculous healing of his son and wife thorough the powerful intercession of Padre Pio. He describes the itinerary of faith, hope and love which he and his entire family went through as they are tried by God who, in his great wisdom and paternal love, makes them experience and share in a very vivid and tangible manner the Cross of his Son, Jesus Christ. And they do this by the hand of the Saint of Pietrelcina whom they had gotten to know more profoundly; in time they have become among the many thousands of his spiritual children spread throughout the world. "The book includes a short biography of Padre Pio, a chapter of verses, quotations and biblical passages which have reached Ambassador Sanches Campos in a providential manner and which have provided spiritual nourishment for him in this difficult journey. This is a conclusion which relates the event from the point of view of three people who lived through the experience: Mila, mother of little Fernando and wife of the author; Father Gabriel Corrales, the priest who brought the relic of Padre Pio to the sick baby and mother; and Archbishop José Rafael Quirós of San Jose, Costa Rica. "The epilogue is the story of the personal encounters of the family with Pope Emeritus Benedict XVI and Pope Francis, and how these Roman Pontiffs have gotten to know of the miracle wrought by Padre Pio. "The book appendix is a collection of prayers, novenas and meditations of Padre Pio, included with the hope of enriching the spiritual contribution and opportunities for meditation that it may offer to the reader. "The book was originally written in Spanish and published in 2010, with a new edition in Spanish in 2012. It has been translated to Italian by Angelo Cardinal Amato, Prefect of the Congregation for the Causes of Saints in 2011 in Rome. For the English version, the book's foreword was written by H. E. Luis Antonio G. Cardinal Tagle, Archbishop of Manila.